Series of recent attacks have tried to choke supplies into Afghanistan for the U.S.
ISLAMABAD, Pakistan (CNN) -- Conflict raged Wednesday in volatile northwestern Pakistan, with nine militants killed in a gun battle, the Taliban's abduction and release of about 30 police officers, and strikes on stranded NATO trucks. Pakistani policemen at a check point in Khyber Agency near the Pakistan-Afghanistan border, February 12, 2008. It's the latest fighting between Pakistani security forces and the Taliban militants in the northwestern region near Afghanistan. The country's central government has little control in the area, and U.S. intelligence officials say the area is a haven for militants. Nine militants were killed when police and local residents foiled an attempted kidnapping of the mayor in a village on the outskirts of Peshawar, police told CNN. Taliban fighters attempted to abduct Fahim Ur Rehman, but police and residents resisted and a gun battle ensued. Along with the slain militants, two police and two civilians were wounded and some of the militants fled. The village, Bazid Khel, is located between Peshawar and the Khyber Agency in the tribal areas. In the Swat Valley, militants abducted around 30 police Tuesday night but eventually released them on Wednesday. Taliban spokesman Muslim Khan confirmed to CNN that the personnel had been released after returning to the path of Islam and promising not to return to their jobs. 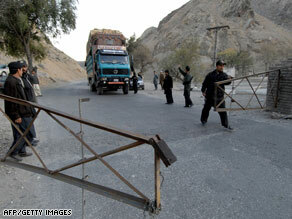 Police told CNN that the security personnel had been forced to agree to the Taliban's terms and confirmed the release. There are conflicting details about the incident, in which Taliban forces attacked the Shamozai check post in the Barikot area of Swat Valley on Tuesday night and captured the people after a nightlong firefight. Khan said the personnel surrendered after Taliban forces mined the area, preventing access. He said their ammunition was seized when supply vehicles coming to assist government forces were stopped by Taliban mines. Pakistan police said the security personnel didn't surrender; they were caught after they used up their ammunition. Police and military sources said the personnel were police, but Khan said paramilitary officers as well as police were among the group. Locals said government forces came under attack Tuesday evening and ran out of ammunition before surrendering. This comes as the Pakistani military beefed up its operations this week in the Swat Valley. In the latest in a series of recent attacks meant to choke off supplies into Afghanistan for the United States and its allies, a rocket strike destroyed at least nine vehicles near the town Landi Kotal in the Khyber Agency -- one of seven semiautonomous tribal agencies along the Afghan border, a Khyber official told CNN. The trucks were returning from Afghanistan but were stranded in the town because, a day earlier, suspected militants had destroyed a bridge connecting Landi Kotal to Jamrod, another part of the Khyber Agency. The bridge's destruction had forced authorities to halt traffic. Because Afghanistan is landlocked, many of the supplies for NATO-led troops fighting Islamic militants there have to be trucked from Pakistan. In recent months, militants aligned with the Taliban and al Qaeda have carried out several attacks to disrupt supplies, Pakistani officials said.